With the summer on the horizon, now is the perfect time to start thinking positive about the summer heat wave we are willing to happen. Essentials for a brilliant and safe summer must include a good source of hydration…and it so happens we have just the thing! The V217-6 is a superb cold drinks vending machine suitable for vending PET bottles and cans. It uses a reliable vending mechanism which has been tried and tested in the field for a number of years. The product has thermostatically controlled forced air-cooling as well as having product pre-cooling. Each column has an individual vend motor and boasts an anti-theft device. Whether your desired location is in an office, school, university, leisure centre, airport or more, this drinks vending machine offers convenient and essential thirst-quenching cold drinks at the push of a button. …cold, ambient, direct chill or merely sparkling! The B4 water cooler by Borg & Overstrom has a fantastic selection of water types to choose from. Despite having compact dimensions, the B4 still features one of the largest dispensing areas. This is an ideal system for more demanding environments (as these can bring with them more demanding consumers with more demanding preferences!). The B4 water cooler, however, does not shy away from the challenge of satisfactorily hydrating the masses! As if that kind of dedication wasn’t enough it also boasts touch panel controls, an integrated cup dispenser, optimum dispense performance and unrivalled hygienic qualities. This is a sleek and stylish mains water-fed dispenser. Thanks to Borg & Overstrom we are all ‘changing the way people drink and think about water.’ Quoted and noted. With only 10 seconds of drying time this hand dryer blows its competitors out of the water faster than it blows your hands dry! Not only is it stylish and sleek but the Magnum Hyper-Dri Hand Dryer is super sanitary and super clever judging by its infra-red automatic self adjusting operation. With numerous features and functionality this product will certainly set the world on dryer. Intelligent Vending are showcasing the Jolly Pro change machine which boasts a range of product features and has an excellent dispensing capacity. It is slim and versatile and has high security against electronic frauds. It can be set up for banknote acceptance only or set up for banknote and coin acceptance and have a coin payment out or a token payment out. With a clear LCD graphic display and a machine cloning function the Jolly Pro is a highly desired, sleek, space-saving change machine. Businesses and schools across England last year were approached with the idea of free vending sanitary products as the impact of period poverty was brought to light. What a smart vending idea! The incentive was met with mixed results, but the topic has remained hot and is still gathering momentum. This easily wall mounted Period Poverty duo vending starter kit would be an ideal place to start for companies or institutions wanting to introduce the scheme. The new GBP £1 coin is nearly upon us and will be released in March 2017. It’s now time for UK vending machine operators to start thinking about updating their coin changers to avoid last minute chaos and lost revenue. We can visit site and reconfigure your vending machine coin mech to accept the new £1 coin. This will involve an engineer coming to site to update the coin mechanism on your machine. The cost of doing this, is £260.00 + VAT and £165.00 + VAT for any additional machines on the same site (UK mainland only). This applies to most models of coin changers including MEI. If you have any queries if your coin changer model is supported, please email sales@intelligentvending.co.uk for confirmation. Please note this is a direct replacement for your existing coin changer and will require you to re-float the new coin mech once fitted as per day to day operation, and as you were trained by the engineer when your machine was delivered. For machines where a C2 Currenza Coin Mechanism is already in use (this is a blue and grey coin changer), we can supply a HENRI service module and an unlimited use SIM level 2 with datablock GBP_0_002_F02_12 for the new £1 coin. This option is extremely economical if you have a number of machines, but it only works with C2 Currenza coin changers (N.B. it will not work for other brands of coin mechs such as MEI). The price of this package is £165.00 + VAT plus shipping and can be found on our website using the following link: www.intelligentvending.co.uk/C2UPDATEGBP1. Please note that this option does not include an engineer call out and will be the responsibility of the client to update their Currenza C2 coin changer in house. However, it’s a straightforward process that literally only takes a few seconds to complete. A crib sheet is also available on request. The HENRI module is a useful item and can also be used for updating your coin mechanisms in the future (only an updated SIM would be required). If you have any doubts if your machine is fitted with a C2 Currenza coin mechanism, please send a photo of your coin changer in advance of ordering so we can confirm. N.B. We will not be responsible for returns if clients order this kit in error. (***) N.B. We will require your coin values for the tubes on your current cassette, or model number (i.e. GBP1, GBP22 etc), so that we can provide you with a direct replacement. If a none standard cassette type is required, the lead time is currently 3 weeks as your device would be made to order. 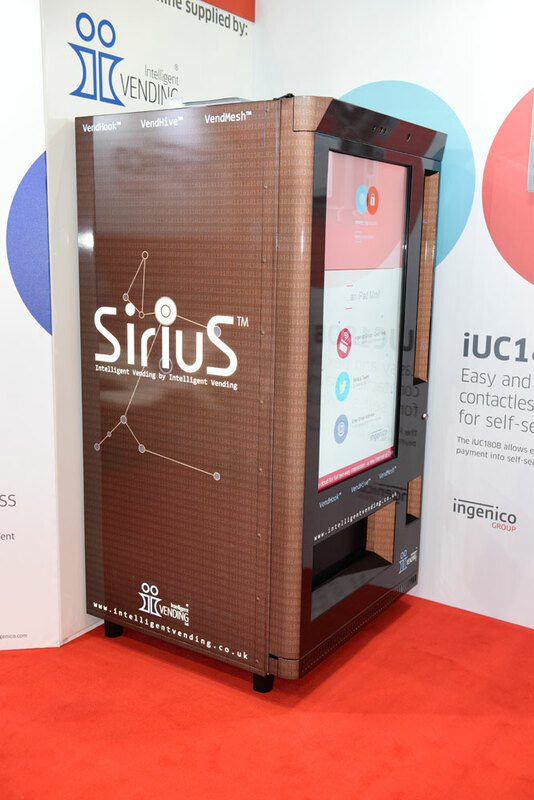 SiriuS™, the latest ‘all-in-one’ solution from Intelligent Vending Ltd, was given its first public outing in the vending arena at AVEX 2015, in Manchester. Partnering with Ingenico the international leader in provision of cashless payment systems, IV offered its new advanced SiriuS™ vending machine to show off their cashless hardware while providing attendees with a glimpse of what it believes is the future for the unattended automated retail market. As an industry, vending has been stagnant or in decline throughout most of Europe for the past few years and it is desperate, Intelligent Vending believes, for a fresh impetus that will lead to reversal of this trend. While degrees of innovation are undoubtedly evident across the board in vending, this has been mostly small scale and incremental, and there has been no major development with the explosive energy to bring about the much needed revolution of the industry. Put simply, vending has made virtually little use of the advances in technology that are now standard across all sectors of retail, advertising, and social media. SiriuS™ incorporates the power and imagination to change all that! An Ingenico corporate video and other promotional information was also displayed on the machine’s different vend process screens, carrying a key underlying message to promote the new iUC280 payment terminals that are aimed primarily for the standard vending ‘mainstream’ market. Also, on show was a premium vinyl wrap designed to showcase Intelligent Vending’s commitment to push visual branding boundaries. Using a newly unveiled printable and wrap conformable reflective material, all the visible panels of the machine were fully SiriuS™ branded. The three elements that define SiriuS™; VendHook™, VendHive™, and VendMesh™, were highlighted in the design. The revolutionary material used for the wrap gives an added, almost 3D effect, that is dramatically revealed across a range of different lighting conditions and changes based on the installation environment (see photos below). 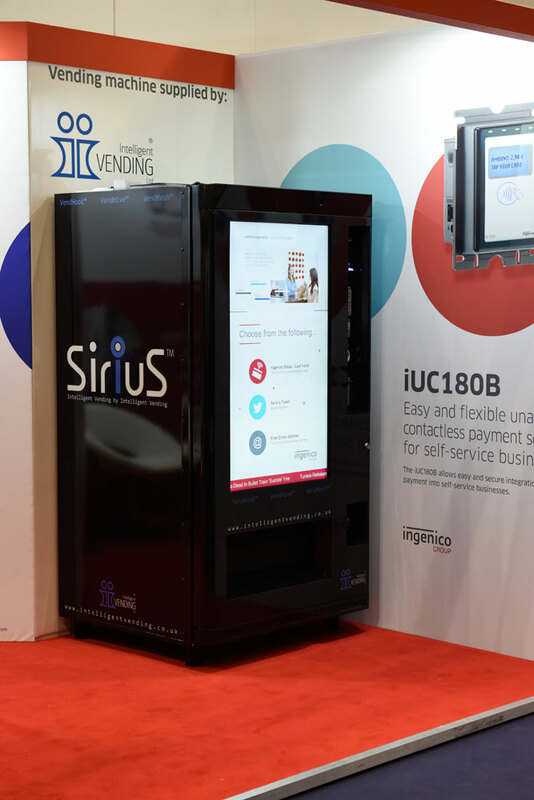 As the first in a new generation of automated retail options by Intelligent Vending Ltd, this new self-service SiriuS™ solution offers a core software platform called VendHook™ designed from first principles, and eliminating the drawbacks experienced with traditional vending machine systems and protocols. The machines are fully modular and packed with functionality. Just a few of the features include large 46” touch screen and HD display, advanced product management, digital signage, social media integration, telemetry and the facility to remotely manage all machine functions & diagnostics in real time via Intelligent Vending’s fully bi-directional VendHive™ ‘Internet of Things’ cloud platform. A key strategy underpinning the design process of Intelligent Vending’s new products was the need to provide a payment option that supported the high value transactions specified by many Intelligent Vending clients. While some card payment systems are available for the ‘mainstream’ sector, they have some limitations in terms of transaction value, and they do not provide VAT receipts, another feature often requested by customers. For its new system, Intelligent Vending has been able to incorporate a full Chip & PIN, Contactless and NFC solution into its machines, fully accredited to the latest Visa and Mastercard standards in the UK and with no cap on transaction values. Our VendHook™ in-house receipt printer design suite also enables our clients’ to customise this ‘print-out’ experience for consumers with a few simple clicks (or touches!) including dynamic QR codes for cross selling or promotions where applicable. Max-eBar® Your Key to Smart 24/7 Hospitality! The Max-eBar® system is designed to provide hotel guests 24/7 access to goods using their room key. Products are dispensed by the Max-eBar® automated retail centre and charged directly to the guests hotel room bill. This provides a convenient, streamlined, reliable, and easy to operate service. The Max-eBar® automated retail centre is usually sited on the guest bedroom corridor or in a central location like the reception area allowing guests to simply swipe their room key, make a purchase and have it charged directly to their room account. No credit cards or cash are required. In effect, this is a ‘max’ version of the traditional ‘mini’ bar with one cabinet able to provide service to many rooms. Also, for added impact, we can provide a fully branded machine by a leading design agency using high-end 3M materials. The Max-eBar® can be free standing or incorporated into a custom built enclosure, depending on the needs to of your organisation and/or budget requirements. Working in collaboration with one of our close development partners Quintus Systems (the originator and inventor of the Max-eBar® system), this reliable & high-end solution now becomes reality and a standard offering for our global hotel clients. Let us integrate the Max-eBar® seamlessly with your hotel PMS and door key system. This is a perfect addition to any hotel environment and we can tailor our solutions to meet your needs with minimal downtime to guest services. Hospitality is just one sector where we can add value, so let us unlock the potential of cashless interfacing within your organisation, whatever your business focus. Intelligent Vending and Quintus Systems have packages to suit small niche hotels to large international chains, so please don’t hesitate to get in contact with us on +44 (0) 1629 825555 or email: sales@intelligentvending.co.uk for more information. One of the most common questions we are asked when customers want to purchase a vending machine is whether the unit will fit into their available space. Ideally, they want a machine with plenty of capacity, but often there is only restricted space in the office, corridor, or alcove to locate it. They then want to know the largest machine that will fit within the limitations described. If the amount of space in the final location is not a problem, they report that the corridors or doorways are quite narrow, and wonder whether it will be possible to even get a vending machine in the building. Most vending machines are quite bulky and heavy, so their size can genuinely create problems, particularly in older buildings which were not designed to provide access for large pieces of equipment. On one occasion we even had to arrange for a crane to get a machine into the building –the canteen had been located on a higher floor and normal access up the stairs was impossible! However, as in life, there is quite a bit of variation in vending, and it may be possible to identify a suitable machine that will fit into relatively small places. Although our quick dimensions search tool (top left of our website) is a great reference, please don’t rely on it completely – if you have any doubts regarding the suitability of any machine for your requirements, please ring. One thing to always bear in mind with machines that incorporate a fridge unit is that additional space not shown on the machine dimensions is needed at the rear of the machine. Fridge units need airflow so they can operate efficiently, so it is always wise to allow an additional 4-5 inches (10 – 12 cm) to the machine depth dimension for this purpose. Refrigeration units that operate without sufficient ventilation have to consistently work harder, which can reduce their efficiency and overall lifespan. A final thought on size and space. We always ask customers to complete a site survey when they purchase a large vending machine from us. This helps us anticipate any problems with access and the possibility of an abandoned delivery because the machine will not fit through doorways, or is too large to get into the lift. Sometimes these forms are not fully completed or the measurements given seem more based on guesswork than actual measurement. It can’t be stressed too greatly that taking care over this stage could really save your costs later. Customers will unfortunately be charged if a delivery has to be aborted because of the inaccuracy of information provided in the site survey. We will incur costs with our transport providers because of this and we have to pass charges on. There will then be further costs if a second delivery is attempted e.g. with door frames removed, or crane accompaniment (very costly!). At worst, if the machine is just too large, with no solution, there is the possibility of even higher costs from cancelling an order. Much better to spend time getting the measurements correct in the first place! If you do have any doubts regarding suitability and the size question, remember, we’re always pleased to assist!